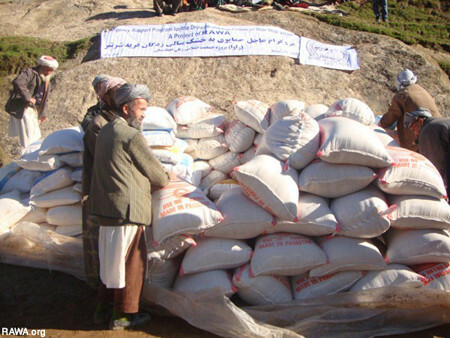 On December 12, 2011, the Revolutionary Association of the Women of Afghanistan (RAWA) distributed emergency aid items to a small village called Shar Shar, in Chah Aab district of northern Takhar province. More than hundred families and 800 people benefited from the aid. Shar Shar is an isolated village near the Tajikistan border. Since there are no proper roads, just small mud lanes that lead to the top of mountains where the village is, it takes a walk of about twenty minutes to reach the village itself. It is one of the worst affected areas in the drought-stricken Northern provinces. The people had no harvest this year and many of their animals died due to lack food and water. There is no drinking water in the area, the closest river is about three hours by foot. The only mode of transportation is donkeys. A government tanker came once a week in the summers but even that was not enough for the families. Most families left the area for better places but those who couldn’t even afford moving had to stay in the area. Not many cars travel to the village due to its dangerous terrain so about six small trucks had to take six rounds in two days to drop the items at the foot of the closest mountain of the village. The area is very cold and gets snow a lot. Once before the project was postponed due to bad weather which didn’t allow cars to go near the area. The items that were bought were stored in a market in Yangi Qala, the nearest city an hour away from Shar Shar. On Monday morning, at about ten in the morning the representative of each family came with their donkeys to collect their items. Fortunately, it was sunny in the morning during the aid distribution, though it got cloudy later and snowed the next day. The names of each family member were already listed, their fingerprints were taken and the aid was given. The people of the village fully cooperated with the elders regulating the aid distribution, and the program ended after about two hours. Two RAWA members were also present. At the end when the items were taken away, the people gathered to thank RAWA and a RAWA member also spoke to them. 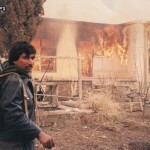 The RAWA members were also invited to the homes of some people in the area. The people showed the spring which had dried, the small lake from which the animals drank water and also a local school set up by the government. The school, according to the people, teaches nothing and the teachers sell all the stationary. There is no clinic, healthcare centre or a doctor in the area either. The people have to travel for days on a donkey to reach a hospital in the nearest relatively advanced cities. This was the first time the people had received any kind of help. According to the local people, the donations are ‘devoured’ by high-ranking officials in the centre of Chah Aab distric who are local commanders. Foreign aid has reached a number of districts closest to the capital Taloqan. This is just one of the thousand villages all over Afghanistan that have not benefited a bit from the billions of dollars poured to the country. 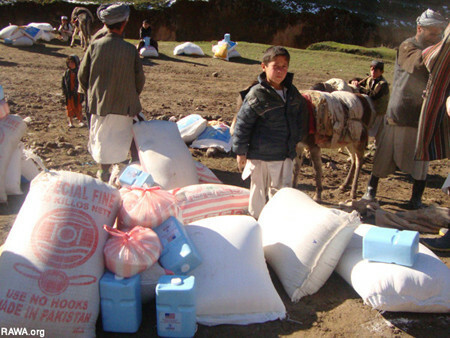 According to the UN 9.4 million Afghans are feared to starve to death if aid is not given. The billions of dollars have eventually ended up in the pockets of warlords and corrupt government officials, leaving our poor people in hell-like conditions.